Ava Catau :: You are what you eat. : I got published! Check out the April issue of the South Coast Insider for my article on local CSAs and asparagus. It's truly an honor to be be published by the South Coast Insider and I look forward to being featured in future issues. The beginning of the calendar year may have been months ago, but it’s the Spring that truly marks the birth of the new year. In the kitchen, the Spring is a time for new fresh flavors from vegetables so tender and sweet that they require very little fuss, quite contrary to the braised stews and long simmered soups that we’ve relied upon all winter long. Our local South Coast farmers are now hard at work as they prepare this year’s harvest: tilling the land, enriching the soil, and sowing their seeds. Soon the farm stands will start opening, farmers markets will be bustling with young families, and our own backyard gardens will start to take shape. What a joyous time of the year! One of my favorite ways to enjoy the local bounty all summer long is to join a CSA. A CSA, short for Community Supported Agriculture, is an arrangement where a family or individual pledges their support for a farm at the beginning of the growing season in return for a share of that farm’s harvest all season long. It’s at this time of year that farmers have to invest a lot of upfront cash for buying seeds, preparing equipment, and paying their employees, even though it may be many weeks before they can begin selling their crops. The members of the CSA pay a reduced rate now, and then receive a box of fresh produce every week throughout the growing season. As a CSA “shareholder” in the farm, you stand to share in the rewards of the farmer’s bounty in the boom years, and help cushion the farmer’s financial burden in the down years. Regardless, your farmer works hard to give you a bountiful supply of fresh, local produce, at an incredible value. I joined my first CSA three years ago, and while at the time CSAs where much harder to find in this area, today many farmers throughout the region are offering memberships. Choosing to buy your vegetables directly from a local farm means you’re not only supporting your neighbors, but also making a healthy decision for you and your family. A CSA is also a fun way to diversify your diet because you’ll likely find things in your weekly CSA box that you wouldn’t normally purchase at the supermarket. Whether it is leeks, artichokes, or an unusual bitter green, your CSA box will force you to cook outside of your culinary comfort zone and explore new flavors. If I’ve convinced you to hop on the CSA bandwagon, act fast, because Spring is the time of the year to sign up! I’ve included a list of just some of the local farmers offering CSA membership this year, but I encourage you to contact your favorite farm to see if they too have a CSA program. Bring a large pot of water up to a boil. Season the water with salt and add the asparagus and sugar snap peas. Cook until just tender, about 3-5 minutes. Using a slotted spoon, transfer the vegetables to colander and immediately rinse under cold water. Set aside. Add the noodles to the water and cook for 13-15 minutes, until tender. Stir the noodles occasionally to prevent them from sticking to each other. Meanwhile, add the garlic, ginger, peanut butter, lime juice, sesame oil, soy sauce, honey, pepper flakes and 1/4 cup water to a food processor or blender. Blend until very smooth (should resemble the consistency of heavy cream, add more water if necessary). Season with salt to taste. Drain the noodles and return them to the empty pot. 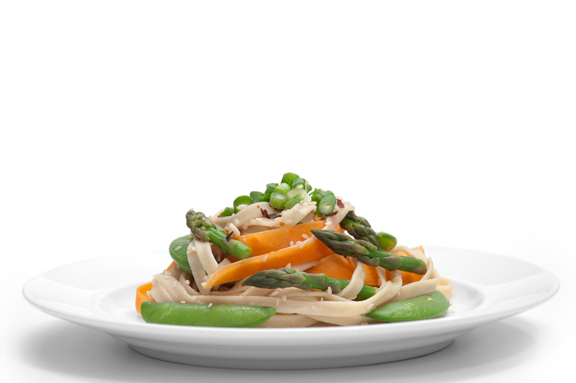 Add the asparagus, sugar snap peas, carrots, sesame seeds, scallions, and peanut sauce to the noodles. Toss and enjoy! Awesome! Looks so good! I can't wait to make it. Nice job Melissa. Congrats! just read the mag this weekend while waiting for my hair cut and txt'd myself your address. great blog!! warmest congrats on the press! i am quite smitten with your blog! Made this last night with some winter veggies (conventionally grown red peppers from who knows where and frozen edamame) and seared tuna. Also used soba noodles. BUT I DID USE YOUR SAUCE! WHOA! AWESOME! !